Those dudes from Cooking Your Spanish do get around. 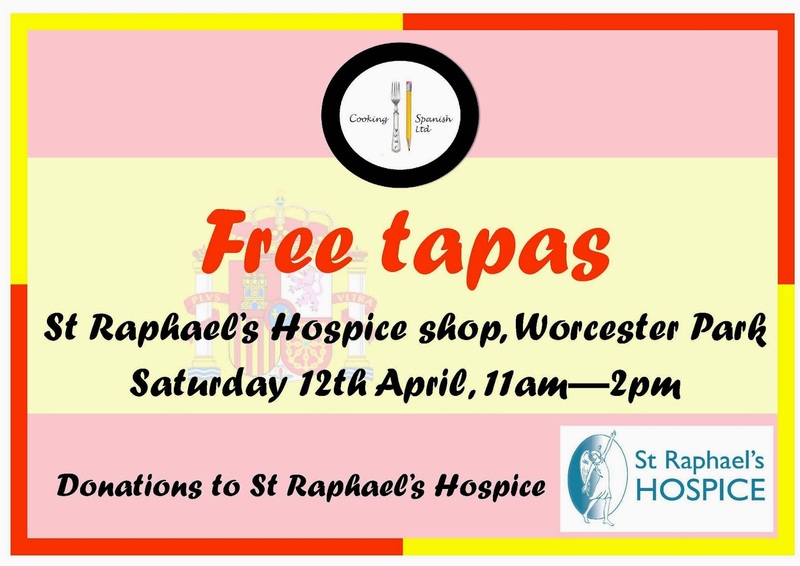 Tomorrow (Saturday 12th April) they will be offering free Tapas at the St. Raphael's Hospice shop in Central Road (opposite Pizza Express) from 11 until 2pm (just right for lunch!). You will be able to find David, Ana and other members of team CYS outside the door of the shop giving away their delicious Spanish snacks. All donations will be given to St. Raphael's Hospice. "Cooking Your Spanish, based on our social responsibility has chosen this year St. Raphael’s Hospice in Worcester Park to do some different fundraising activities. The first one will be next Saturday 12 April from 11am to 2pm. We are going to be at the shop doing a Tapa tasting, offering two of the most popular tapas voted by our students. The voluntary donations will go entirely to St. Raphael’s. I want to see how it goes and my wish would be to collaborate with a local Charity every year."